Monday again! and with just one week to go until CHRISTMAAAS Eve I am starting to feel VERY festive! Last week was a busy one. I spent the majority of the week getting lots of ladies christmas party ready with heaps of glitter, smokey eyes, red lips, berry lips…ah I had such fun, BUT, butttt I did fail massively on achieving my two per week target on this series of posts all about our wedding day. I am back on track today and i’m confident it’ll be worth the wait. Todays post is packed full of details all about the heart of our day, the main event: our ceremony. Pop the kettle on and settle in for some inspiration. Your ceremony is lets face it, is what it’s all about. We often get distracted by the enormity of the day but it’s during this small portion of your wedding day that you declare your wedding vows and ultimately leave the room as husband and wife. With this in mind, we wanted our ceremony to be as special as it possibly could, to set the tone for the rest of the day- packed full of details, thought and love leaving everyone pumped for the day ahead and getting our best day ever off to the most perfect start. 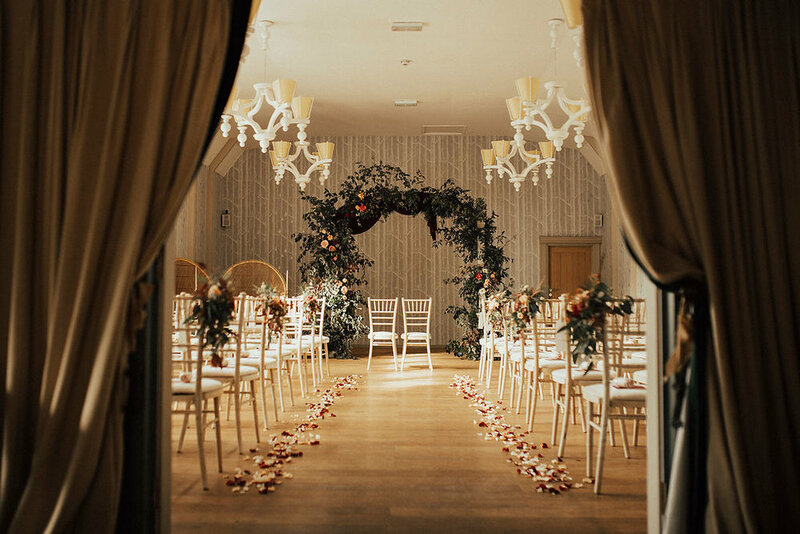 We had our ceremony in The Birches, the civil ceremony room at our gorgeous venue Hampton Manor. We loved this room right from our first viewing of the venue, just like the rest of the venue the attention to detail and style was impeccable and we knew we would love to host our ceremony there. We led the way to our ceremony room for our guests with signage created by my super talented bestie and bridesmaid Sian. She worked tirelessly in the build up to the wedding day to create these beautiful, hand made calligraphy signs, made all the more special to both of us knowing that they were made by her. We had a ceremony sign leading down to The Birches and outside, alongside two giant urns filled to the brim with floral delights by our florist Lucy Walker framing the entrance. Since the wedding Sian has decided to put her talents to good use and set up a calligraphy business specialising in all things wedding stationary. It’s still early days but why not give her a follow on Instagram: @siansmithdesigns, to stay fully in the loop and be the first to know when her shop is live! We were so lucky to have Gemma and her team from Save the Date Event Stylist on board for the wedding day to style and prep the room to perfection meaning we literally didn’t have to lift a finger! I got in touch with Gemma at the start of the year and took a visit to her treasure trove of a showroom for inspiration and to chat styling. Having worked with Gemma previously on shoots I knew her eye for detail was immaculate and her repertoire of styling items for hire was bang on for what we wanted to achieve. On the day her and our florist Lucy worked together in harmony and walking into the room on the wedding day, the first time I had seen it set up in it’s entirety, it truly was everything I imagined and more! Before entering the ceremony room, The Birches has a fabulous room thats bursting with character and just the right amount of higgledy piggledy. 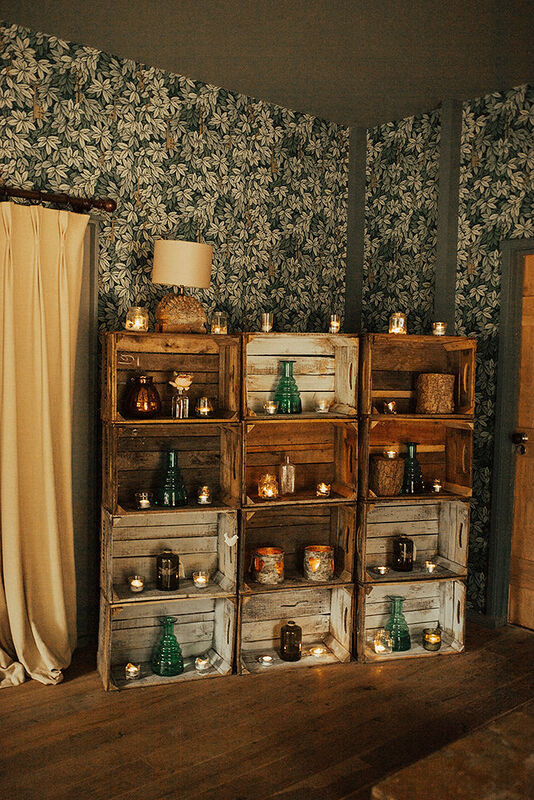 It’s William Morris wallpaper, tassel lamps and wooden crates made into book shelves all scream style and we were so pleased our guests had this room to filter through on their way to the ceremony room. 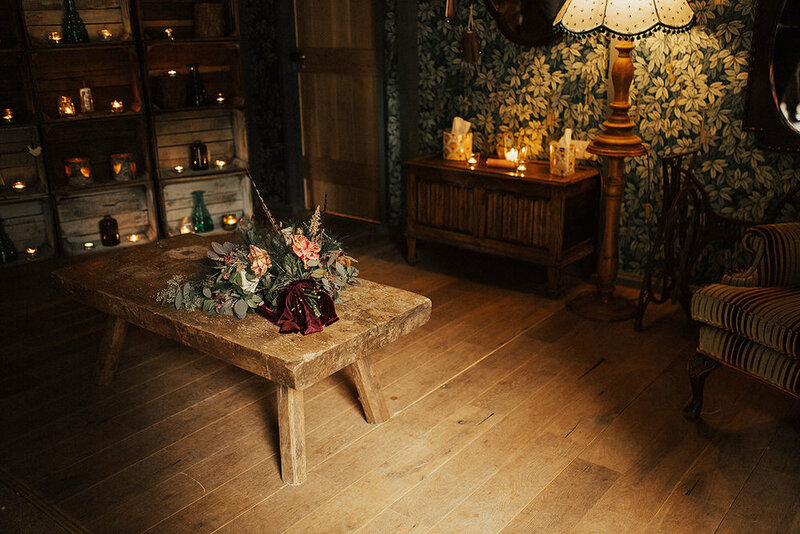 Gemma and her team filled this room with tea lights and copper terrariums while Lucy dotted little vases with single stem roses for added pops of colour. The aisle was lined with fresh petals from The Confetti Cone Company to compliment the rest of our wedding florals. We had a full seating plan for our ceremony. This isn’t the norm and not a necessity by any means but having attended a lot of weddings ourselves we wanted to save our guests the uncertainty and awkwardness of not knowing where to sit. 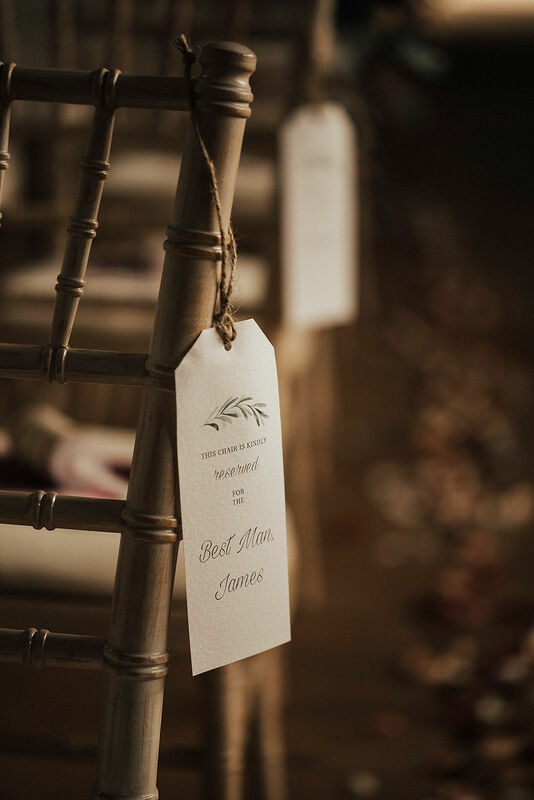 Our ushers helped direct guests at the door and I purchased an instant download seat reservation sign which I customised for each guests names and attached rustic string so they could be hung on the appropriate chair on the day. 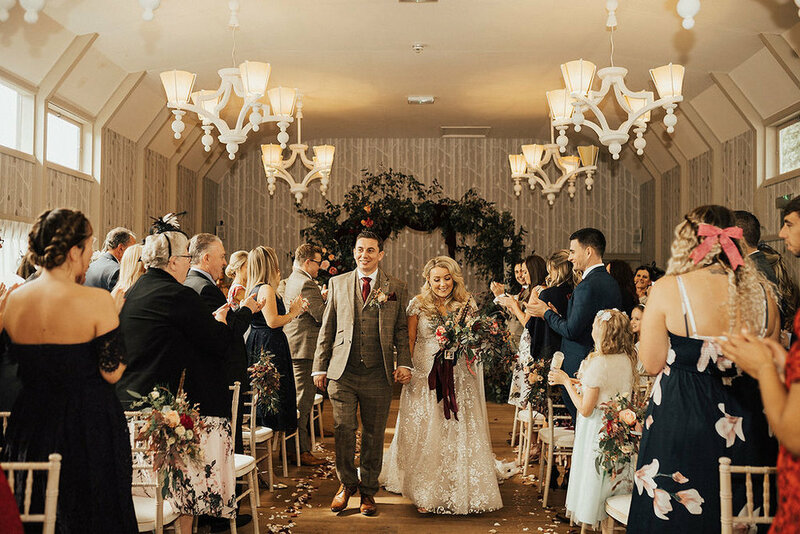 Lucy dressed the end chair on alternate aisles with a glorious floral arrangement that added incredible colour and detail leading everyones eyes towards the front of the room where we would exchange our vows. On each chair we placed an Order of Service. These burgandy beauties from Project Pretty couldn’t have tied in any more perfectly with our wedding day colour scheme, so much so I did a little dance when I came across them in the summer. On every other chair we placed the tiniest, sweetest box of tissues I have ever laid eyes on! I stumbled across these from a seller on Etsy and just knew they’d be a gorgeous addition to our ceremony set up. They came in VERY handy to dry lots of teary eyes too! 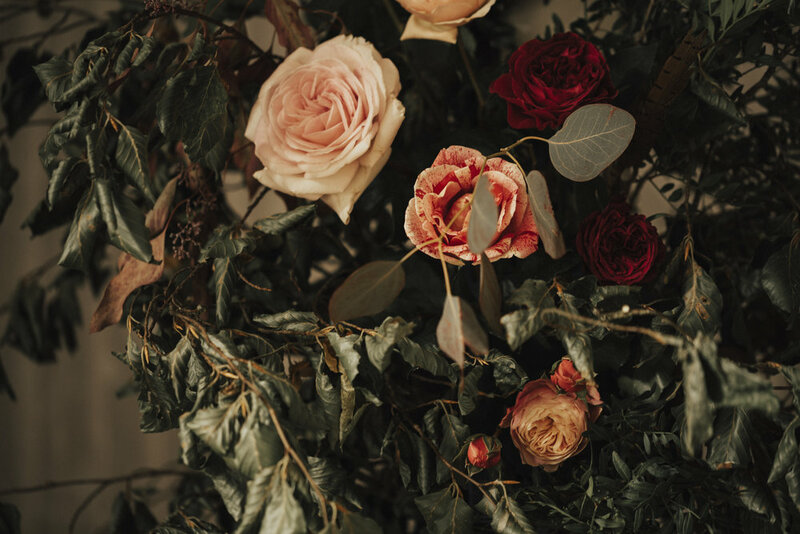 The dream team- Gemma and Lucy, dressed the table where we would sign our marriage certificate with a suave of Eucalyptus and Roses in rich burgundy and sand pink tones. Finished with two gold candlesticks with taupe tapered candles and a collection of gold terrariums. It was during our visit to Gemma’s showroom that I spotted her pair of Peacock Chairs. These high backed basket chairs couldn’t be more extra and I knew they’d make the ultimate ceremony chairs and focal point for this special moment. Now, the pièce de résistance: The floral arch. WOW a WEE WOW, now I knew from our many meetings that Lucy had BIG plans for this floral arch but nothing could prepare me for it’s epicness. It stood at just under 8ft high, it’s wooden frame hired from The Prop Company was dressed to perfection with a suave of burgundy velvet Mum and I picked up from a haberdashery and an abundance of greenery, David Austin Roses, Pheasant Feathers and far too many more flowers to mention. It was stunning, the ultimate focal point of our ceremony room and packed so much WOW factor many of our guests still ask us about it now. The best part was it’s wooden frame was easily dismantled and so with a little muscle power, we were able to move the arch to the terrace so it could be enjoyed and admired for the entirety of our wedding day. Our Ceremony was made complete and given so much heart with music. I have always been a lover of gospel and soul music and had always dreamt of having live gospel music on my wedding day. Knowing this, during the early stages of our wedding planning Rob insisted we prioritise our search for a Gospel Choir. It was during this time we came across Gospel Touch and instantly we knew our day wouldn't be complete without them! On the day they warmed up our guests while they waited for me to come down the aisle to sweet sounds of Bob Marley and Beyonce to name just a few. Rob said the atmosphere was incredible, they left everyone smiling and even eased his nerves. As I walked down the aisle the choir sang 'As' by Stevie Wonder, one of our favourite songs with lyrics so beautiful and very appropriate on such a day. After the ceremony we walked out hand in hand as Mr and Mrs to another by Stevie Wonder- 'Signed, Sealed, Delivered...I'm Yours", again lyrically it seemed pretty appropriate and left us with an even bigger smile on our faces! With the ceremony complete and now officially husband and wife it was time to kick off the days celebrations! We had placed a confetti wand from The Confetti Cone Company on each of our guests seats during the ceremony, armed with these confetti cannons our guests gathered outside The Birches to shower us in confetti as we made our way over to the venue for our drinks reception. These cannons sure looked cute but didn’t pack as much punch as we expected and so our confetti shot wasn’t quite as colourful as we hoped but everyone was kept very entertained in trying to make them work! We all headed over to the venue for our reception and Hampton Manor’s incredible team greeted us with generous amounts of fizz and canapés. Gospel Touch re set up and entertained us with their talent for the duration of these celebrations. The lobby area and the beautiful parlour at Hampton Manor where we hosted our reception drinks interiors and styling is already so perfect, it needed no help in the way of decor. We simply placed an Order of the Day sign we had made by Wildflower Illustration Co which perfectly illustrated how our special day would pan out so guests knew what to expect when. A traditional caste iron postbox in a very wedding shade of white we hired for guests to post cards and gifts. Finally our ‘Let’s Eat’ Table Plan that was hand drawn onto a mirror gifted to us by one of my lovely brides, by bestie, bridesmaid and calligraphy extraordinaire Sian sat on an easel at the bottom of the staircase so guests could see where they would be sat for our Wedding Breakfast. So that’s a wrap on setting the scene for the first part of our best day ever. Check in later in the week for all the details on how the rest of the day looked. All products and suppliers hyperlinked into above text.